In Japanese, we use three writing systems: Hiragana, Katakana, and Kanji (Chinese characters). Understanding Japanese writing systems and how they work are crucial in mastering the language. You must be aware of how each set of characters functions especially if your goal is to learn to write in Japanese. In this article, I am going to cover the fundamental aspects of Hiragana, Katakana, and Kanji. We use Hiragana to spell words that are native to Japanese, such as Nihon (Japan), sakura (cherry blossom), hashi (chopsticks), okaasan (mother), as well as Japanese names and grammatical elements. For example, Japanese young children first learn how to say chopsticks “hashi” or “o-hashi” as growing up and listening to their family members saying the word. When they begin schooling, they start learning Hiragana letters. They gradually build connections between sounds and characters as they master each letter like “ha” is は, and “shi” is し. By the time children learn all the 46 letters in Hiragana, they can precisely spell words as they pronounce them. 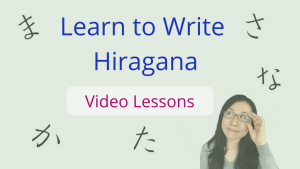 I have Hiragana video lessons for you if you are serious to learn to write Hiragana letters. Katakana is used to spell words that are NOT native to Japanese. For instance, Nihon (Japan) is a Japanese-origin word, hence has to be spelled either in Hiragana にほん or Kanji 日本. Amerika (America), on the other hand, is not a Japanese-origin word. It is a word imported from English and has to be spelled in Katakana アメリカ and not in Hiragana あめりか. Katakana is also used to transcribe onomatopoeia, which imitates the natural sounds of objects or animals. For example, “Bang!” in English is written in Katakana バン！(ban!) in Japanese. Dogs bark ワンワン (wan wan) and cats say ニャー (nyaa). The sound of the strong gust is ビュー (byuu) and dripping water is ポタポタ (pota pota). 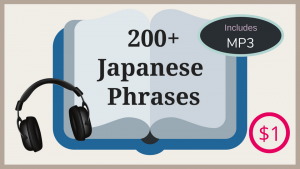 There are tons of onomatopoeia phrases that exist in Japanese and make each description more expressive and interesting. I am sure that you have encountered many of them if you are an enthusiastic reader of manga. It is literally impossible to create manga without using a single onomatopoeia expression. I will cover more on this in a separate blog. Just like Hiragana, Kanji is also used to spell Japanese words. Why do we need Kanji when we already have Hiragana to spell Japanese native words? I told you earlier that Hiragana letters are phonetic, meaning they tell you how to pronounce the word. The problem here is that they convey ONLY the pronunciation of the word. Why is it a problem? Well, in Japanese it’s very common that several different words share the same pronunciation. It’s a little similar to the case of “night” vs. “knight” or “knew” vs. “new” in English. They are totally different words sharing the same pronunciation. What differentiates them? It’s spelling. If you spell it “n-i-g-h-t” it refers to the time of the day after sunset, and “k-n-i-g-h-t” refers to the man, in shiny armor, who would come to rescue a princess. In the case of Japanese, it is Kanji that differentiates the meaning of the word. I earlier used the example of chopsticks “hashi” はし in the Hiragana section. If I look at the word “hashi” はし written in Hiragana alone, without any context, there is no way for me to determine its meaning as the pronunciation of “hashi” can mean something else too. If “hashi” is written in Kanji, however, I can instantly tell the meaning of it. Therefore, Kanji is a vital part of the language, and schools in Japan teach children about 1000 Kanji by the time they finish the 6th grade. An average grownup usually knows 3,000 to 3,400 Kanji letters. 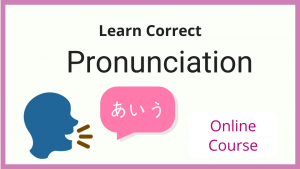 Interested in learning Japanese online? Check all the courses HERE. Here is a typical sentence in Japanese. kinoo Amerika no tomodachi ni meeru shimashita. アメリカ (America) and メール (email) are in Katakana because they are loan words from English. On the other hand, 昨日 (yesterday) and 友達 (friend) are in Kanji and the rest is in Hiragana. This is how a typical native Japanese grownup would write this particular sentence. Now, compare the sentence above with this one below. It is exactly the same sentence except for that I converted the kanji parts into Hiragana. This is how a 7-year old child would write the sentence if s/he has not yet mastered the kanji for “yesterday” 昨日 and “friend” 友達. As an adult, it is very hard for me to read this sentence because I cannot recognize units of the sentence without Kanji in it. Traditionally, we do not use any spaces between letters in Japanese. If everything was written in Hiragana and Katakana only, I would have a hard time to separate specific words (in this case, “yesterday” 昨日 and “friend” 友達) from other elements in the sentence at a glance. Hence, it takes a longer time to comprehend the sentence. Learning Kanji is not an easy task, I agree. We, native speakers, have invested hours and hours in mastering them as well. However, once you get used to them, Kanji drastically contributes to your reading ability and speed in Japanese. If you are serious about mastering the language, I strongly encourage you to start working on Kanji characters. Understanding Japanese Writing is the Start! I hope this article helped you with understanding Japanese writing systems and why we need three sets of characters. Learning new letters could be a long process and require perseverance on your side. Do not rush, and take one step at a time. Let’s begin with Hiragana! I have lessons ready for you to learn how to write Hiragana letters accurately. Each lesson comes with a step-by-step video. I also have Hiragana chart and practice sheets prepared for you to download. Provide the information below and I will send them to your way right away! In the future, I am planning on adding more stuff for Katakana and Kanji learning as well.